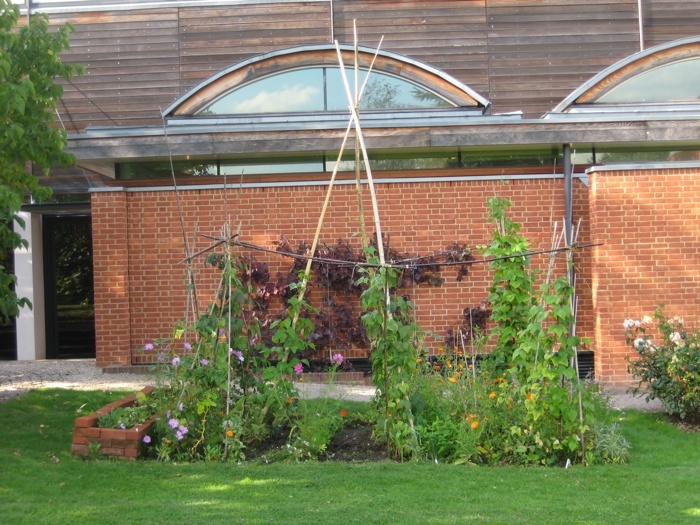 2nd September 2011 – Allotment Plot at MERL – For the human it was a very warm day, in an exterior context, such as the garden, but not if placed in an interior, where it seemed much cooler and autumnal. Ella Montt crouched next to the Plot. 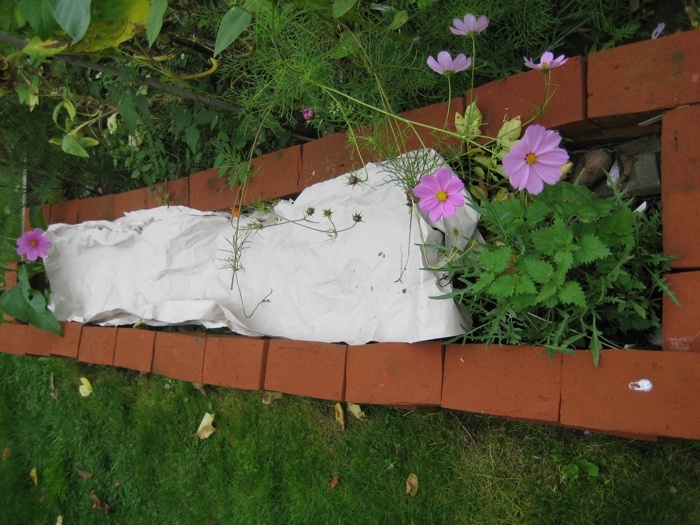 Her body moved slowly around the edge, redefining and removing plant material, then the plant residue was gathered and deposited in to the Brick Composter. The watering can was needed and fetched from the Shed. There had been no rain since sometime last weekend, when there had been a fair amount that was an assistant in mud making for the Festival. Ella Montt dug up the rest of the Potatoes. EB examined them carefully. The Potatoes were with out disease or skin blemish aside from a few marks of damage received from the garden fork. EB was satisfied with the result. Beans were harvested. Unfortunately, most of the Squash plants were dissolving and composting themselves in to the soil as a result of cold weather. The Tomatoes looked without blight, but were mainly still green. A profusion of Pot Marigold flowers were suddenly lit up by sunshine that fell to Earth and illuminated the Plot, but this illumination did not last for long and the vibrant orange flower objects were darkened as the sun disappeared behind a grey cloud, shading the Plot. Ella Montt scattered a mix of Chard, Lettuce and Wintergreen Cabbage seeds that are suited to September planting, in the place that the Potatoes had been extracted from. Companion Planting seeds heads were gathered to be saved for future Guerilla Gardening broadcasting (at a later date). Harvest: Seeds from Companion Planting, Calendula Pot Marigold, Cosmos Cosmea, Borage, Chamomile = 3oz = 80g; Tomatoes = 0.5oz = 10g; Potato Eve Balfour = 6lb 3oz = 2.8Kg; Bean (French Climbing) = Blauhide = 8oz = 220g; Neckarqueen and Blue Lake – 1.5oz = 30g; Barlotta Di Fuoco = 4.5oz = 130g; Beans (Runner) Enamor = 14oz = 400g. 5th September 2011 – Allotment Plot 326 – The last of the blighted Tomato plants were removed, some Tomatoes were saved from the deadly disease. A blighted Tomato appears to transform its flesh rapidly in to that of a Zombie, an un-dead Tomato, the fruit becomes ugly and rotten with decay putrefying other Tomatoes it comes in contact with. Blight is a deathly, airborne fugal disease from which there is no cure apart from fire, burial or very high temperature composting that will nullify the toxicity and eradicate the spores. 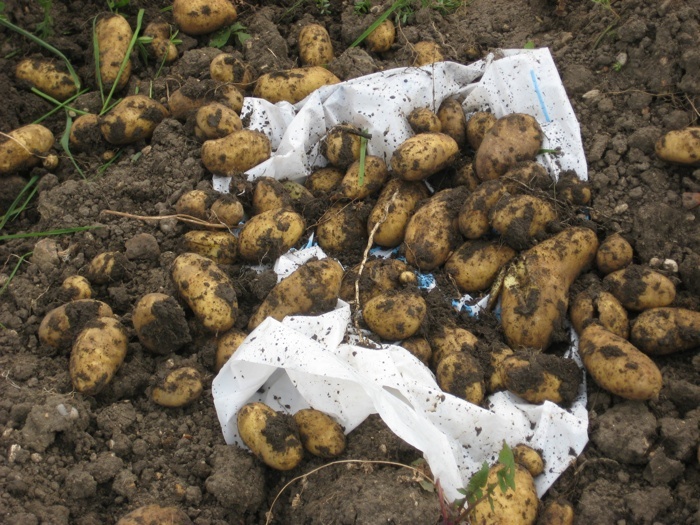 The Potato crop remained perfect, untouched by the blight, as the final tubers were removed from the soil. Harvest: Potato Charlotte and Sante = 10lb 5.5oz = 4.72Kg; 2 x Beetroot Bolivar = 5oz = 140g; Spinach Perpetual Leaf Beat = 7oz = 200g; Oriental Greens Tai Sai = 3.5oz = 90g; mix of Chard = 4oz = 110g; Beans (French Dwarf) Royalty = 6oz = 160g; mix of Beans (French Climbing) Blue Lake, Neckarqueen, Barlotta Di Fuoco, Blauhide and (Runner) Enorma = 11.5oz = 360g; Kale Red Russian Curled = 2oz = 50g; Tomatoes = 6oz = 180g. 8th September 2011 – Allotment Plot at MERL – Ella Montt drew sketches of the Allotment Plot with pencil on a length of recycled paper (30cm x 400cm). An observation was made of the drawing as it wrapped itself over the Bamboo frame the surrounds the Plot. The drawing or the paper was then folded in to the Brick Composter to brake down in to the soil. If art is part of all objects that inhabit the surface of the Planet, all objects being part of nature, whether or not they are shaped or unshaped by humans, then returning the drawing to the soil will speed up the process that art can be made by perpetuating new resources for human animation. The human world is overloaded with commodities; green businesses produce more commodities, which strive to be more centered on the best use of planet resources yet remain commodities. There is no escape (as yet) from the perpetual thinking that business has to thrive and economies must boom, as human breeding approaches the figure of seven billion occupying the planet. The humans forget sometimes that they are all animated pieces of soil and will return to the soil and compost when their animated time has run out. Meanwhile the process of humans desire for objects, (which is basically material borrowed from the Planet, then rearranged in to assemblages that become other material/ objects/ commodities), can extinguish other human and non-human life forms. William Morris lent over muttering words from his utopian novel explaining that humans realized eventually that the obsession with commodity and market growth would eventually dissolve. It was a dark and cloudy day, it became darker and darker. Harvesting commenced: mix of Beans (French Climbing and Runner) = 14oz = 400g; Wild Rocket, Coriander Santos and Chives = 2.5oz = 70g; seeds from Companion Planting Calendula Pot Marigold and Cosmos Cosmea = 1.5oz = 35g; Tomatoes = 6.5oz = 180g. The Tomatoes at Allotment Plot at MERL were not afflicted with blight. 14th September 2011 – Allotment Plot 326 – The night was extremely cold for the time of year. The fear of frost started again. Harvest: Courgette Patriot F1 x 2 = 8.5oz = 240g; Courgette Cocozelle x 2 = 2lb 14.5oz = 1.32Kg; Oriental Greens Tai Sai = 5.5oz = 150g; Beetroot Bolivar = 2lb 12oz = 1.22Kg; Beans (French Dwarf) Royalty 4oz = 120g; a mix of Spinach and Chard = 8oz = 230g; Beans (French Climbing) = Barlotta Di Fuoco = 2oz = 50, Neckarqueen and Blue Lake 4oz = 110g; Beans (Runner) Enamor = 5oz = 140g. 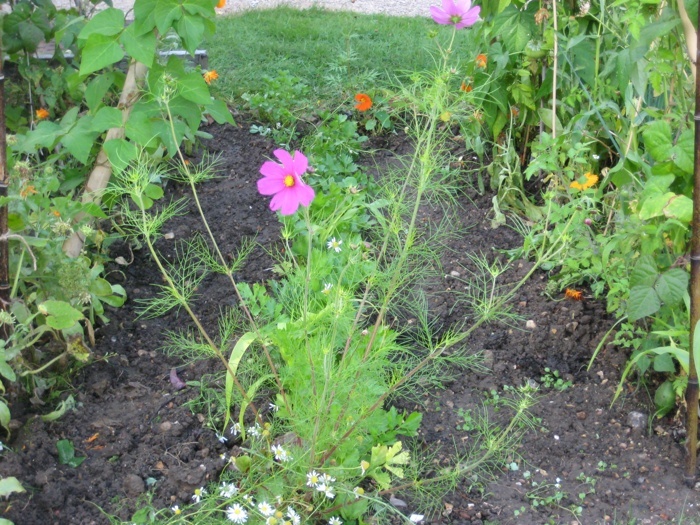 15th September 2011 – Allotment Plot at MERL – Ella Montt had experienced fear, during the darkness of the previous two nights. A sense of doom had accompanied the contemplation of the recently waning gibbous moon that hung first low as a golden ball close to the planet just above the human rooftops and trees, and then high, piercingly white in its intensity in the upper hemisphere with stars reflecting the white light in their pinpointed geometries. The nighttime temperatures had plummeted and there had been weather reports the there could be ground frost in rural areas. Both MERL and Allotment Plot 326 were in rural areas. 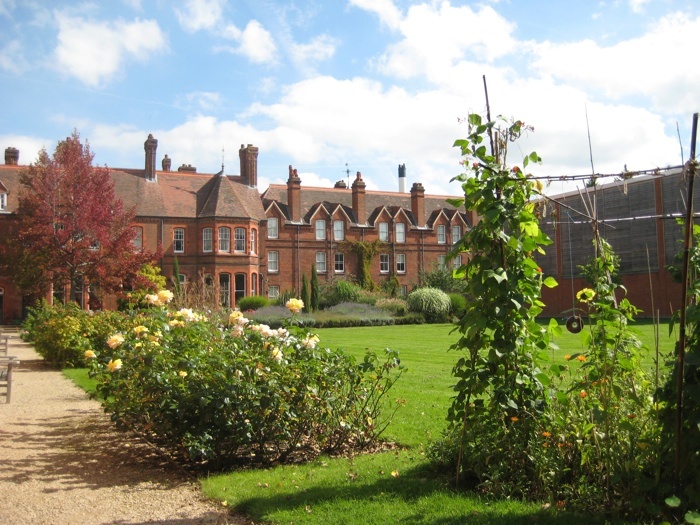 MERL is in itself a place of rural areas, because it is a Museum of English Rural Life, yet the garden has some shelter, because the buildings on two and a half sides surround it. 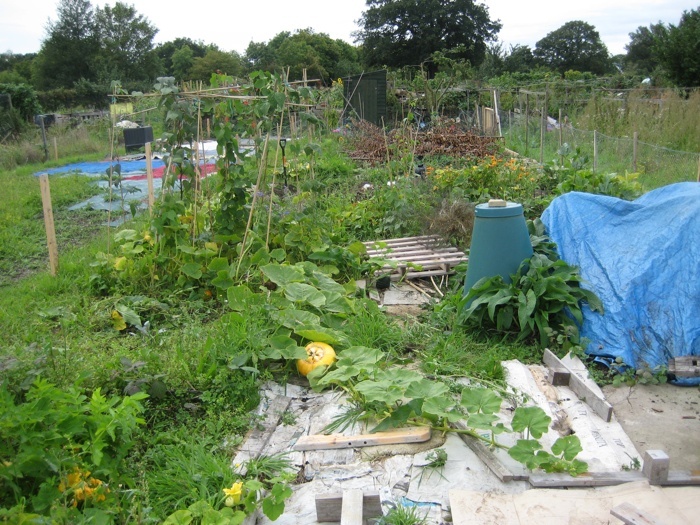 Allotment Plot 326 is on higher exposed ground that is wide open to the elements; there is no defense from the sky. The clarity of the cloudless atmosphere welcomed the onslaught of freezing temperatures that drop through infinity to hit the planets surface, but this time the vegetables plants were saved and the temperature remained above zero, for now. Parsnips would welcome the frost, because it increases the sweetness of their root, but for other plants frost would mean annihilation, a sudden death, deconstruction of their vibrant matter would become inevitable and a signal to return to the soil from whence they came. Ella Montt was aware that tragedy would need to be avoided, monitoring of temperatures resumed. The early summer in April 2011 seemed long ago. At Allotment Plot at MERL, the one Squash plant that looked like it might support a fruit had yet to be successfully fertilized. 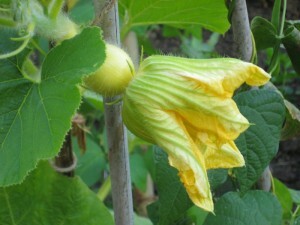 A female flower rotted on the vine, whilst another was unsure if a bee would pollinate it. Ella Montt searched for a male flower to assist in the operation, finding one she transported pollen to the waiting female flower. 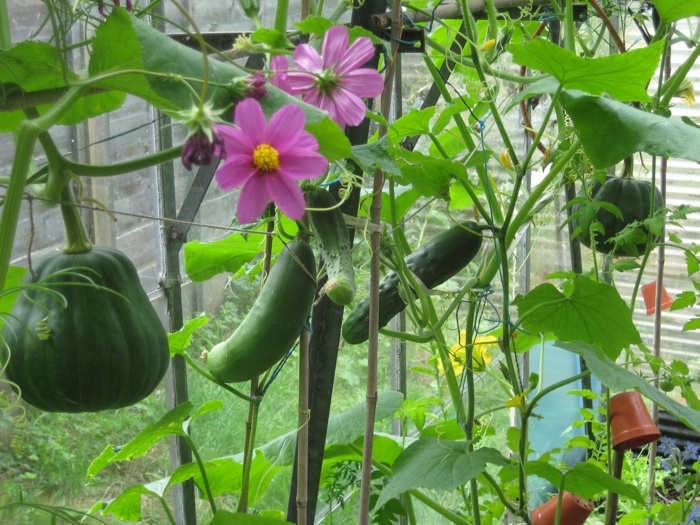 Some of the other Squash plants at Allotment Plot 326 had successfully produced fruit, although not as many as anticipated, and also inside the fixed up green house at another location, both Squashes and Cucumbers were in the process of successfully production. The Brick Composter had started to take on a plant life of its own. 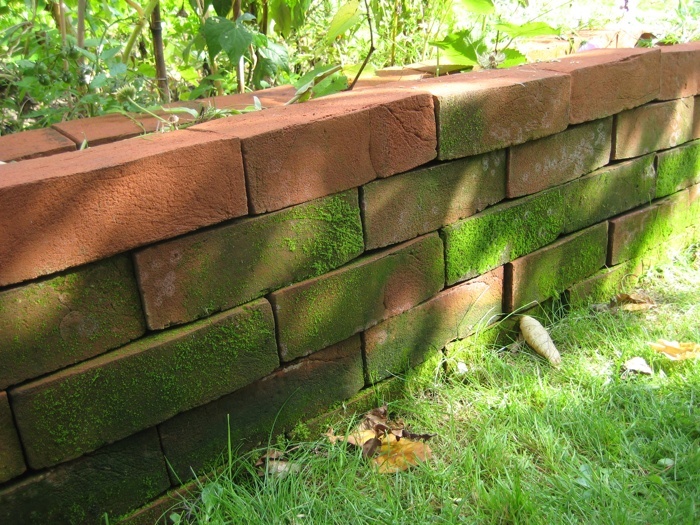 The bricks were accumulating a green covering. The colours of green were beginning to fade, but were still punctuated with the pulsating colours of the Companion Planting. 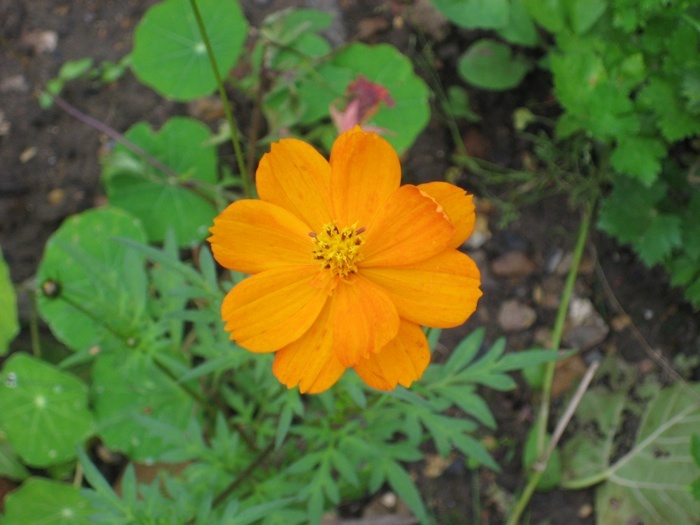 The Cosmos Orange Cosmea was flowering, its flower is different to the pink and white Cosmos Cosmea. Across the garden the established perennials were vivid in their autumn shades. Ella Montt thinned out some of the Pot Marigolds so that light could penetrate the Tomatoes ad ripen their fruits. Water was applied to the Plot and plant residue gathered in to the Brick Composter. Harvesting commenced. Harvest: a mix of Companion Planting seeds heads, Calendula Pot Marigold, Cosmos Cosmea and Chamomile = 1oz = 20g; Tomaotes = 1lb 7oz = 650g; Beans (French Climbing) Blauhide = 1.5oz, Neckarqueen and Blue Lake 2.5oz = 70g, Barlotta Di Fuoco = 3oz = 80g; Beans (Runner) Enorma = 9oz =250g. 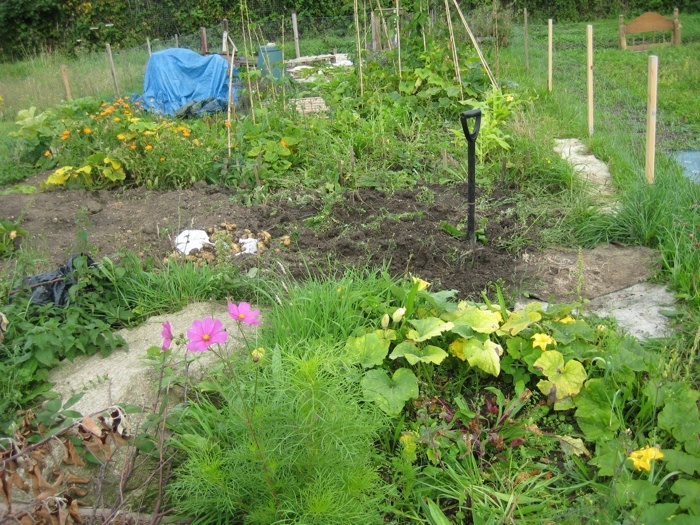 16th September 2011 – Allotment Plot 326 – Ella Montt had recently uncovered a large mound of compost that had been covered for a year by a tarpaulin. The Compost had broken down in to new soil. The soil had been dispersed, but not removed from the area. 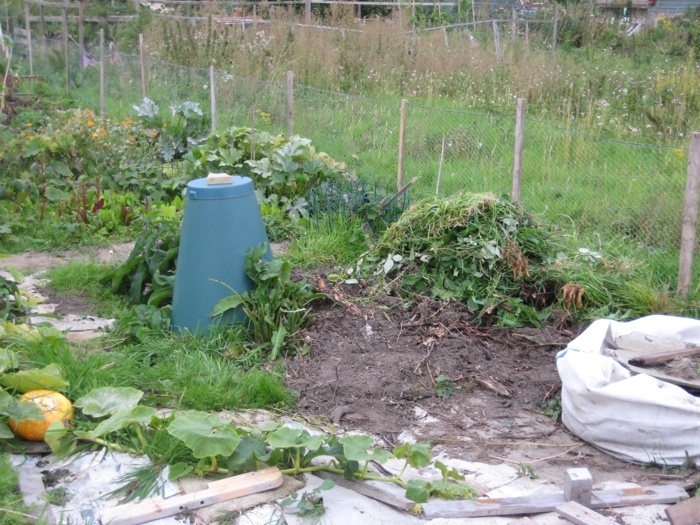 Ella Montt was in the process of adding more material to the compost that included grass, nettles, comfrey and other excessive plant residue that was growing on the Plot. Over the next few months Ella Montt desires to organize composting strategies at Plot 326 and digging will commence in areas of the Plot that have so far remained uncultivated. Cardboard Compost Lasagna will aid in the break down of the soil to assist in its workability. The next growing year from October, when Garlic and Onions will be planted, shall seek to optimize the Plot. This last year two areas of the Plot remained un-planted, 20011-12 will re-engage with the performance of productivity in order to off-set the lack economic growth in the public sector of commodity, the human obsession of which remains futile in the history of the universe. 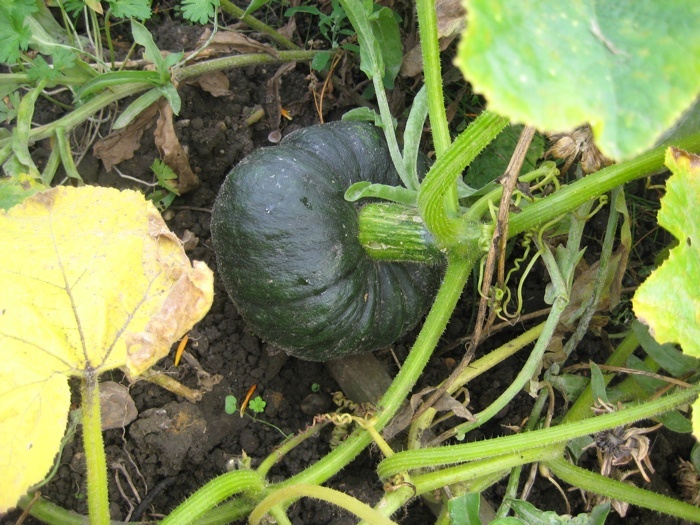 Harvest: Squash 1 x Buttercup = 3lb = 1.37Kg, 1 x Green Hokkaido = 1lb 14oz = 850g. 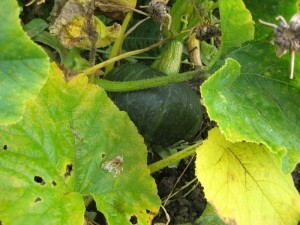 This entry was posted in Allotments, Blight, Compost, Harvest, Object and tagged Allotments, Commodities, Compost, Objects, Squash, Tomato, Zombie on September 18, 2011 by katecorder.